Rumah Makan Padang (Padang Restaurant) is a restaurant offering selection of food from Padang and neighbouring cities of West Sumatra. People of Minangkabau, or West Sumatra, especially from Pariaman region, are very famous of their entrepreneurships in the food business. It was said that if people from Padang go out from their birthplace, they will make a restaurant, resulting in the amount of Rumah Makan Padang in many cities of Indonesia. In Jakarta alone, there are at least 20000 Rumah Makan Padang registered, as reported by Iwapin (Indonesia Alliance of Padang Restaurant). You can easily spotted Rumah Makan Padang from afar. 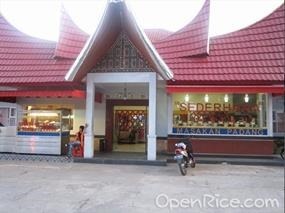 Rumah Makan Padang usually build with roof shaped like Rumah Gadang (Gadang House), traditional house of West Sumatra. The horn-like roof, coupled with glass display showcasing stacked plates of side-dishes, makes every hungry souls going past the restaurant to enter and eat there, from early in the morning to night. In Rumah Makan Padang, you can eat by first taking a plate and fill it with steamed rice by yourself. 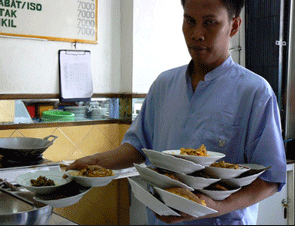 If there is a tukang sanduak (attendant), you can choose for full (penuh) or half (setengah) plate of rice. You can then choose and take the pre-cooked side dishes you want from the selections available in the restaurant. You can then pay and go to the tables. Don’t forget to order drinks to accompany the food, the most common drinks are sweetened tea and lime juice. Laden with coconut-milk-based curries and spices, the signature taste of Rumah Makan Padang‘s menu is spicy, some restaurants are famously spicier than the others. Although I do warn you if you want to eat in Rumah Makan Padang if you can’t stand the heat, it’s not that there is nothing milder in the selection. 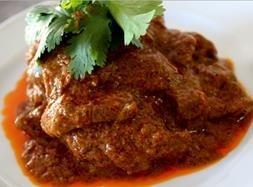 Rendang (braised beef cooked in coconut milk), chicken curry, gulai kepala ikan (fish-head curry) and ayam balado (Minangkabau-styled chicken) are usually highly seasoned with spices. Ayam goreng (fried chicken) and perkedel (potato patty) are some of the more neutral selections. Various fish dishes are also available, from squid, ikan bilis (fried anchovies), gurameh (carp), until lele (catfish). Anything coloured very red is usually spicy. 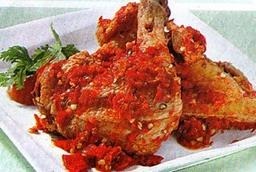 For the lovers of the heat, you can add more sambal (chili-based condiments) such as sambalado ijau (green chili varian of sambal) or buruak-buruak (sambal with salted anchovies, jengkol (dogfruit), stinky bean or eggplant). Do ask the waiter for their suggestion for your taste and your wallet. 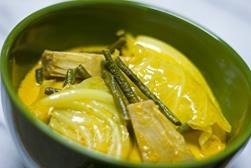 If you don’t eat meat or fish, there are also many selections of side dishes, curry, and soup that can be chosen, such as various tempe (soybean cake) and tofu dishes or gulai cubadak (young jackfruit soup), pucuak ubi (cassava leaves) and sayur kapau (vegetable curry with jackfruit, cabbage, and string bean) . For some of the fancier establishment, you can see the unique sight of servers bringing all the meal onto your table with 3 plates or more stacked in their hands. This method of serving is special for Rumah Makan Padang. With this method, the side dishes will quickly come overflowing until it seems like a banquet. Don’t you feel overwhelmed by the amount of food laid out, because the principle of Rumah Makan Padang is that you only need to pay the food that you take. Just choose the side dishes that you want and don’t touch the rest of them. You can eat with the cutlery or by hand with using air kabasuah (finger bowl) for washing your hand. This method is very suitable for a party of two people or more. The already stocked pre-cooked food selections make Rumah Makan Padang the ‘fast food franchise’, very quickly available for quick meal for the hungry and for takeout. When you take it out, you can choose the side dishes and the dishes of your choice will then wrapped inside oil-paper with steamed rice. Making your meal as takeout also usually means more rice inside the wrapping than eating in the restaurant. The amount of rice in the take out alone can be allotted for two meals. Eating in Rumah Makan Padang is quite polarizing in price. Because of the varieties of the side dishes, you can eat particularly cheap for a very full meal by choosing the cheaper side dishes and soups, but can also be quite expensive if you go all the way and choose more than one kind of meat. 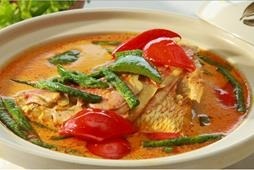 Some restaurants offer vegetable curry and vegetable soup for free, and also second helping of rice. If you add the gravy from the curry or the soup on to your steaming rice, even the simplest of meal will taste heavenly. Do you feel hungry enough? If you go to Indonesia, don’t forget to eat in Rumah Makan Padang! If you are lucky, maybe there is one built already in your country. Posted on March 24, 2014, in Scattering and tagged aseankorea, buffet, culture, food, indonesia, restaurant, rumah makan padang. Bookmark the permalink. 1 Comment.